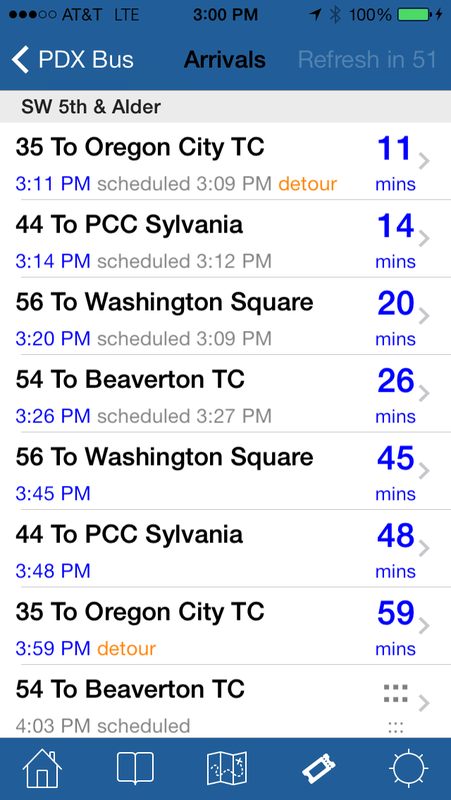 PDX Bus - a free Open Source iPhone app for Portland bus and train times: PDX Bus version 11.0 will be available today! PDX Bus version 11.0 will be available today! I've been working on updating this for the last year, and so finally I hit the release button. A lot changed behind the scenes - new data from TriMet, and combining the queries to make it faster, so the code has changed a lot. Updated for iOS 12. Added basic support for Siri Shortcuts. I intend to release even better Siri integration in a few weeks - just testing it now. I will release the code when that is all done. Updated to use new TriMet data - may include more details about delays, vehicle IDs, vehicle types and when busses are full. Improved speed of arrival downloads by combining queries. Updated detours to use new TriMet alert data - including system wide alerts. They also show the start and end time. Removed "Rider Alerts" as it was basically the same as the detour list and renamed the detours to be "Detours, delays and closures". Detours also include messages about the streetcar. You can adjust how many arrivals are shown. In the settings there is a new setting "Don't show route after arrival > N mins away". Arrivals for each route served at each stop will be shown up to the first that is further than the chosen number of minutes away. Updated Twitter links, as TriMet now has three Twitter accounts. Late color is now magenta, as some people thought brown was a bit close to grey. VoiceOver text for detours improved to pronounce local TriMet words better (eg 185th Ave TC MAX Stn). Added search to detours, recent stops, recent trips and this What's New screen (pull down for search box). Maps: There is a new option to show the route paths on the maps. These paths are useful, but they are a 10 MB download so this is off by default. 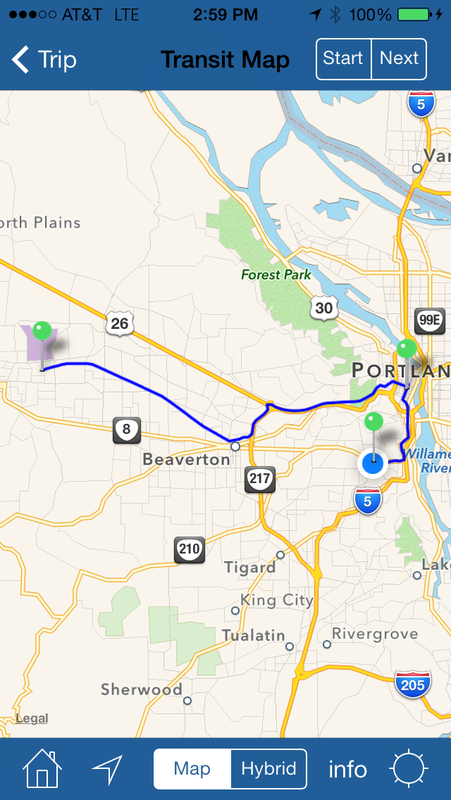 I love this feature but there is a bug in the TriMet data which bloats it by 3 times the size it needs to be! There is a setting to turn it on if you want to try it. 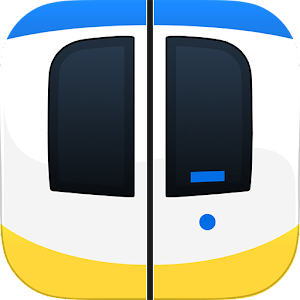 Watch: Improved commuter bookmark user-interface - it will show when it is active in the title. Watch: When locating stops, it will show you the routes and directions served by each stop. Watch: Added a swipe left to move to the next stop, and improved speed and stability.